To what extent was Cuba responsible for the fall of apartheid? This essay will neither try to determine the complex chain of events that brought about the fall of apartheid in the early 1990s, nor to rehearse the role of Cuban military engagement in Angola from 1975 in this narrative. Instead, it presents two connected questions: in what name did Cuba become engaged in Angola, and how does this help us understand the global context of anti-apartheid? To tackle these questions, one could almost ignore the outcome of the conflict itself and focus directly on the principal motivations for Cuba to send up to 50,000 soldiers to fight in southern Africa from 1975 to 1991. As idealistic as it may seem, it was first and foremost in the name of non-racialism that the Cuban regime sent its army to intervene irreversibly in the history of southern Africa. As such, this chapter is not a political, diplomatic or military history of the Cuban intervention in Africa. 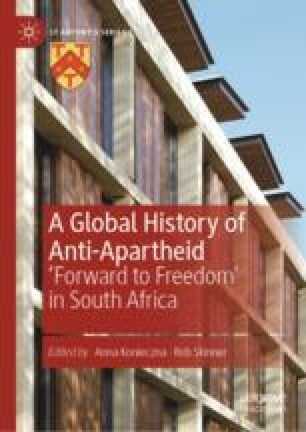 Besides the need to complete such a narrative adding the South African views, it is rather a contribution to the cultural history of the concept of apartheid. Based on discursive analysis of the references made to the segregationist regime from the other side of the Atlantic, this contribution aims at rescaling the international dimension of a concept still far too national in tone. As a matter of fact, it was in the name of apartheid, or rather against its name, that Cuba became engaged on the soil of southern Africa—military engaged, unlike the majority of anti-apartheid movements around the world. As such, a slightly different history of non-racialism emerges from the war in Angola, a history no longer opposing two antagonistic models (mestisaje vs. apartheid) but instead, through a number of reciprocal cultural references, delineating a common history. Roundtable on Piero Gleijes. Visions of Freedom: Havana, Washington, Pretoria, and the Struggle for Southern Africa, 1976–1991, by Chris Saunders and al, H-Net. Accessed August 15, 2016, https://networks.h-net.org/node/28443/discussions/34846/h-diplo-roundtable-visions-freedom-havana-washington-pretoria-and.